This 2-CD set is a bit of a mystery. It is NOT a collection of soundtrack music from "Catastrophe 1999". Instead, it is a straight recording of the entire film from beginning to end, including music, dialogue and sound effects. The movie was released in Japan August 3, 1974 and in the US July 13, 1979. 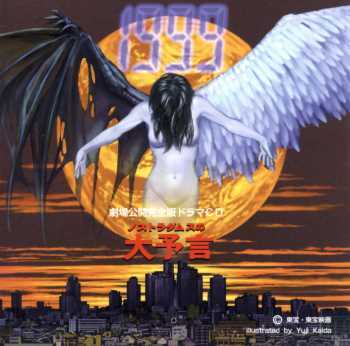 According to the book "Tokyoscope", this double CD (like the similar HALF HUMAN [2-CD soundtrack with complete dialogue] (TG-1012~13) was only made available as part of an elaborate boxed set of memorabilia related to the film (but not the film itself, which is now banned). This CD is probably the only way to experience the narrative of the original Japanese film today (the butchered American version is a poor substitute). Unfortunately, the recording offers little to listeners who don't understand Japanese, so I would only recommend it to completists. Fans of the music would be better off with CATASTROPHE 1999 / THE WAR IN SPACE [OST Masterpiece Series] (VICL-5080) or CATASTROPHE 1999 (VPCD-81173) elsewhere on this site. Pollution Archipelago/ The True Humanism?